Ruby is a beautiful mature Scarlet Macaw. He hatched in 1993. He was a pet shop bird from weaning until 2 years of age. Because of the pet shop environment, Ruby learned to be fearful and aggressive out of that fear. He was rescued by the Alaska Bird Club in Anchorage, AK. Because of early mistreatment in the pet store by customers and staff, Ruby needed years of rehabilitation and even then he never complied with the kind of behavior needed to be a companion parrot. He was introduced to a Blue & Gold male named Zeus upon rescue and the pair have a strong bond. 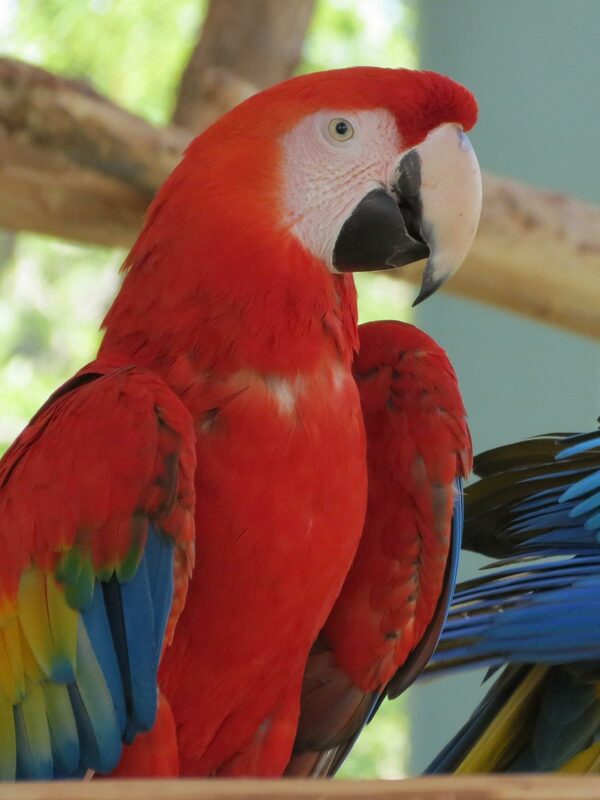 Ruby arrived with Zeus and 5 other macaws from Alaska in May 2008 to reside in our Macaw Aviary. Ruby & Zeus quickly adapted to aviary life. They have their territory, which has not changed through the years. They are very happy in their forever home at The Oasis Sanctuary.